When it comes to implementing early alerts, it can be most helpful to both instructor and students to do so at the beginning of the semester. Learn more about providing academic support to your students from The Office of the Provost’s site for Early Academic Referrals. Access course reports under Control Panel > Evaluation > Course Reports. To run a report, mouse over the report you want to run, select the dropdown arrow that appears, and select Run. Note: If you receive an error after selecting Run, log out and back in to Blackboard or try running the report from a different web browser. It may take 1-2 minutes before the report is generated for viewing. Displays overall activity in the course and gives you the option to see the activity in a course for an individual student. Running this report will prompt you to input start and end dates for the report. Does posting a video to prep for class encourage students to log on as compared to readings? 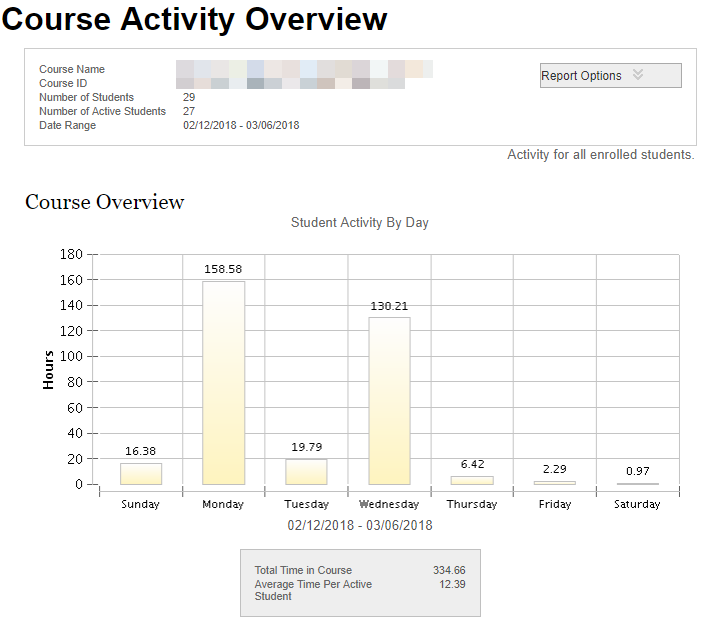 How long, on average, do your class students log onto Blackboard? If students spend insufficient time despite having reason to (e.g. readings, assignments, etc.) it may help to talk to students to find out why. 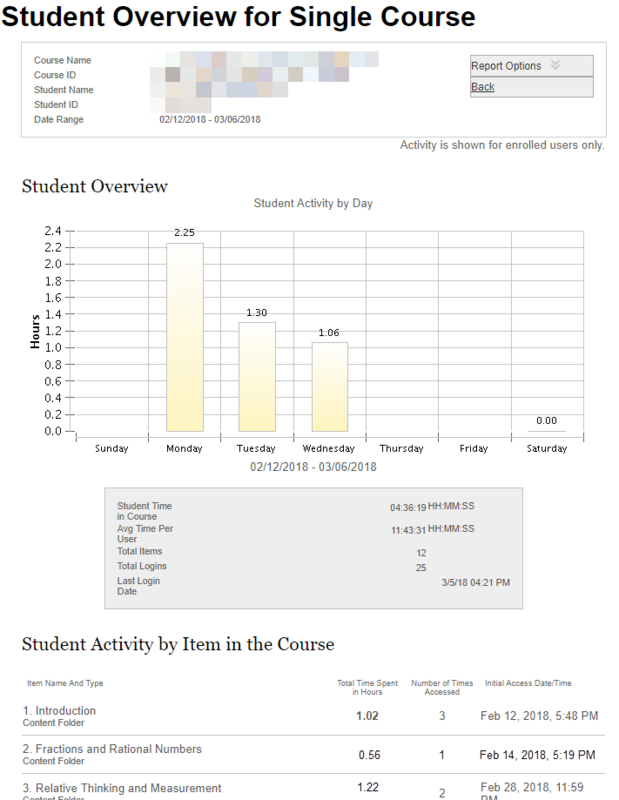 If you notice students tend to log on more often on a particular day, consider how your course design might prompt such use. For example are your assignments due then? Are announcements posted that date? Use this information to identify specific students to meet with you during office hours. 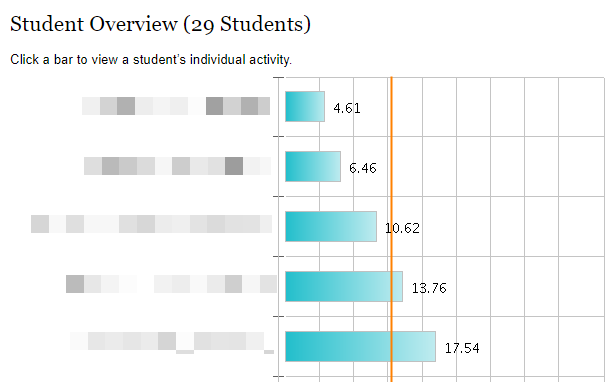 Selecting one of the bars will show you a detailed report for that student. You will be able to see how many times a student accessed a particular area of the course in the time frame selected and the time they spend in the area. Note: The “time spent in hours” data can give you a general idea of time spent in the course. Use this information in conjunction with Grade Center to discuss specific course content students struggled with, during office hours. Examine for content that has not been well received by multiple students. 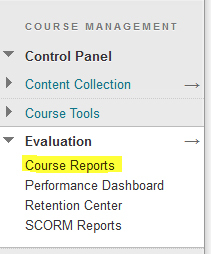 Set up your Blackboard course space so that it is organized and students can easily find what they need. Populate the course space with the basics so that students get used to going there for information. Using the assignment drop box can save paper and increase efficiencies. Having students complete a low-stakes assignment (e.g., syllabus quiz, introduction to the class/instructor, etc.) within the first week allows them to get used to navigating Blackboard. Contact an AOI instructional designer if you would like to discuss implementation of these reports and other design strategies.